Most importantly, I discuss whether it’s worth your money. NOTE: This is an honest review written with integrity and no hidden agendas. Please be wary of online reviews that take a certain stance and then push you towards alternative products, specifically because they earn the writer more commission. If you want to learn more about this, you’ll probably find this review interesting. 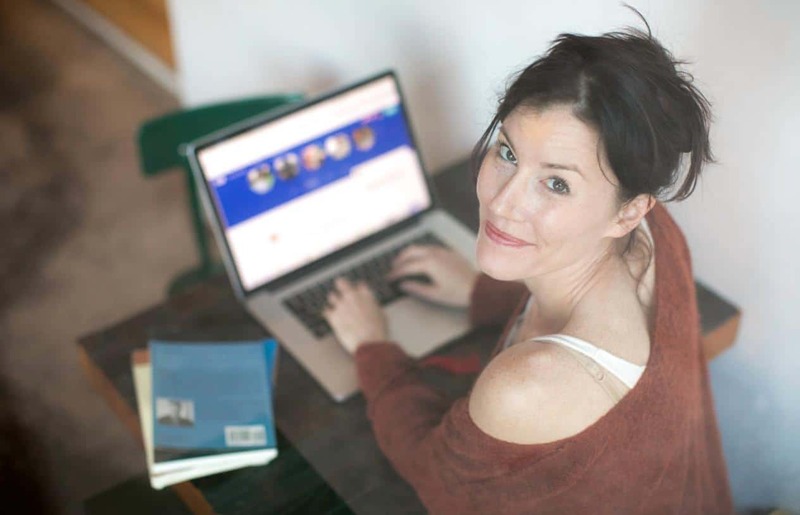 Writers Work is an online service that aims to act as a “one-stop” destination for writers, offering job listings, training materials, and a selection of tools to help writers manage and share their work. Writers.Work is NOT a company employing writers directly, despite what their “creative” adverts may seem to suggest – more on that later, so read on! Curated live listings of writing jobs from a range of online sources. A list of publications that actively seek pitches for articles, along with details on how to submit work to each. A personal project management system for organising writing jobs, documents and tasks. 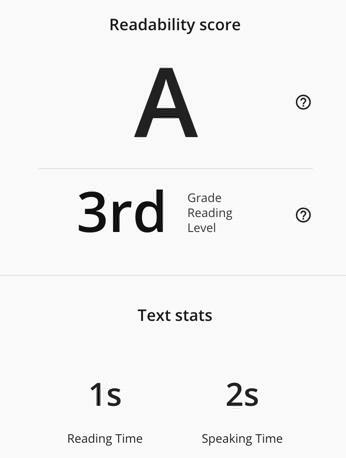 A web-based text editor that incorporates readability analysis to help improve your work. An online portfolio area to share with clients. A Writerswork “University” area containing a library of training resources for new writers. A selection of features to keep track of your work, including functions for time logging and statistical analysis. It’s quite an impressive list, and I explore each of the features in turn below. I have to admit that when I saw what Writers Work includes, I was fearful that it would come with a hefty price tag. However, I was pleasantly surprised. Shortly after writing my original Writers.Work review, the service started to court some controversy. I continually update this review as I find out more, and it’s now on its third revision. Although I was largely impressed with Writers.Work when I originally reviewed it, a fact was brought to my attention by a reader shortly after publishing the review that soured my experience. Essentially, it turns out that the people behind writers.work were previously behind another online product for writers – a product with a distinctly negative reputation. I have left the main body of the review in its entirety, as it represents the product exactly as I found it, but there is a section towards the end discussing this situation in detail. I suggest reading the review in full, including this final section, before making any decision to purchase Writers.Work. The way that Writers.Work is marketed doesn’t sit particularly well with me. I’ve gone into detail on this below too. But to begin with, let’s look at the product itself. Writers Work’s pricing is very straightforward. 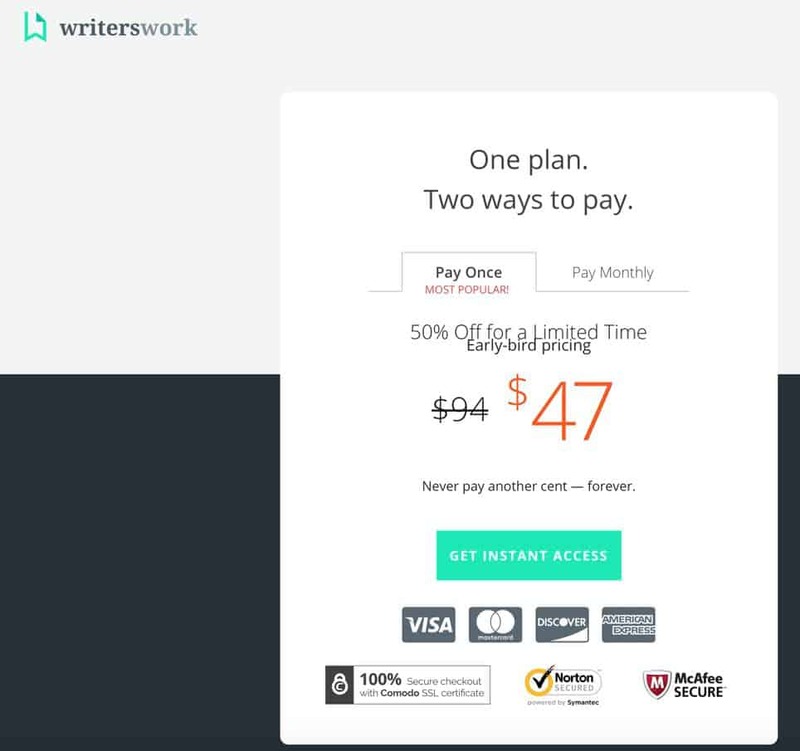 You can either buy a lifetime subscription for $47 (this is an “early bird” price that will apparently increase to $94, although it hasn’t since Writers Work was launched! ), or pay monthly at a cost of $15 per month. This pricing is low and transparent, and it’s fair to note that it’s considerably lower than the pricing of a similar offering, which will remain nameless! While the latter may include a few notable features that aren’t available here, the same applies the other way around, and writers.work is dramatically cheaper. Writers Work also comes with a 30-day money-back guarantee. I also understand there are now some optional “upsells” with Writers.Work, including additional coaching / training materials. This review concentrates on the core components. Writers.work curates writing job listings from a range of sources, and puts them all in one place. It’s not the only service that does this, but it undoubtedly saves time. Writers typically spend many hours searching for new gigs and sending out pitches, and having a bunch of job sources in one place beats having to trawl lots of different listing sites – day in, day out. If you look at the screenshot below, you’ll probably notice something that I imagine some people will criticise about Writers Work: The job listings come from places like Indeed and Problogger. Now this means that the jobs are also freely listed elsewhere online, so you’re not getting anything here you couldn’t find elsewhere. However, job listings aren’t the only feature of writers.work, and having them all in one place is clearly far easier than searching multiple sites. What makes the job listings feature especially useful are the filtering features shown on the left. Filters include the source of the job, the type of job, and the salary expectations. You can also do keyword searches. 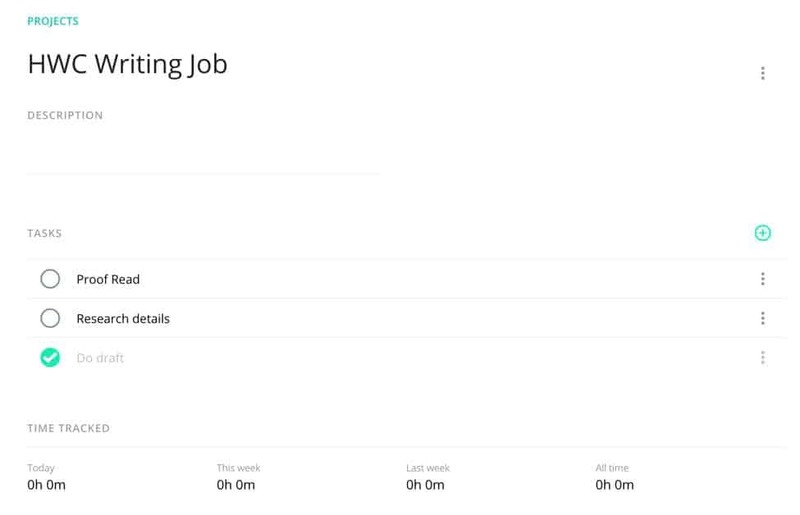 It’s possible to save filters so you have preset job searches to run, and you can ask to be notified daily, weekly or instantly if any jobs come up meeting your search criteria. Having an instant notification for new jobs is invaluable, as people who get their applications in first often put themselves in an advantageous position. While I like the way the job listings of writers.work function, I do have a couple of criticisms. First off, it would be good if there were listings being pulled in from more sources, as in some cases selecting a bunch of filters all at once resulted in only a handful of opportunities remaining. Secondly, I couldn’t find a way to organise my search by how old the job listing was, nor filter out jobs that were posted some time ago. It would be good to see this feature added, as jobs that were posted over two weeks ago are probably already filled, and seeing them gives a false impression of how many real opportunities are out there. Even so, this isn’t a deal-breaker. My personal recommendation would be to set up alerts for the brand new jobs, and concentrate on grabbing them fast. There are countless online articles that list publications that pay for articles, but writers.work has curated dozens of such opportunities into a searchable list. It’s a genuinely useful way for writers to find places that may pay for their work. 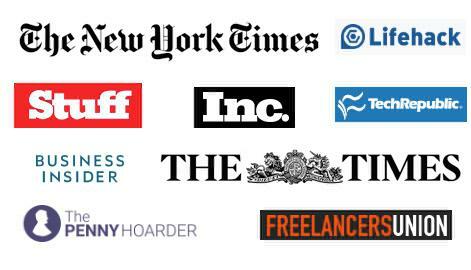 There’s a decent (although not huge) range of opportunities here, and they range from “entry-level” publications paying $50-100 per article to big names paying $1 per word. You can search using various criteria. 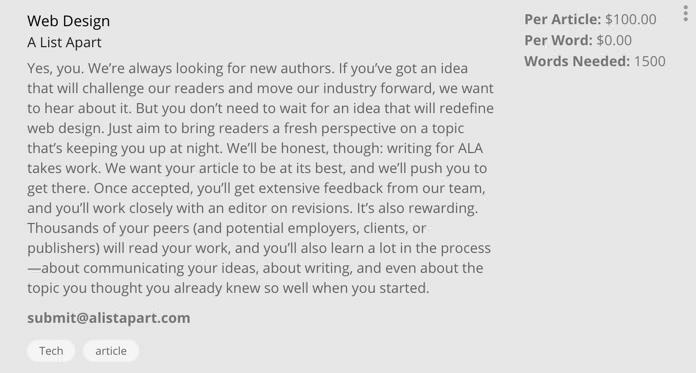 This feature gives writers a place to find pitching opportunities and is quite useful. If the writers.work team manage to keep it stocked with a steady stream of new opportunities, it could cross the line into really useful. Writers Work isn’t just about job listings. It’s also intended to be the place where you manage all of your live writing projects. The reason I say that this feature may not be useful to everyone is that I, for example, already have ways to manage all of these things, from listing tasks to tracking time. However, I shouldn’t reject a feature just because I wouldn’t use it personally. If I was just starting out as a writer, I could see the benefit of using something like this to organise my work, and as it’s cloud-based it’s all accessible from anywhere. It’s a useful feature, but not something that makes writers.work a “must buy” on its own. My instant reaction when I discovered writers.work incorporates a web-based text editor was to wonder why anyone would possibly want to use it instead of Microsoft Word or another favoured word processor. However, I’m willing to stand corrected after checking it out. The main reason is that the text editor incorporates a readability score and reading grade level that updates in real time as you type. There are also live word, sentence and character counts, and a spell checker. Finally, the document editor links smoothly into the other Writers Work features, so you can – for example – track the time you spend on a document and link it to a particular project. I was rather surprised by writers.work’s document editor once I started digging below the surface. I’d been ready to dismiss it as a feature for a feature’s sake, but I actually found a rather slick and well-thought out distraction-free word processor designed to include the things that writers typically need. I’m not convinced that, personally, it would be enough to tempt me away from Microsoft Word, as I use far too many advanced features and keyboard shortcuts. However, a new writer establishing a workflow for the first time may decide to use it all the time. 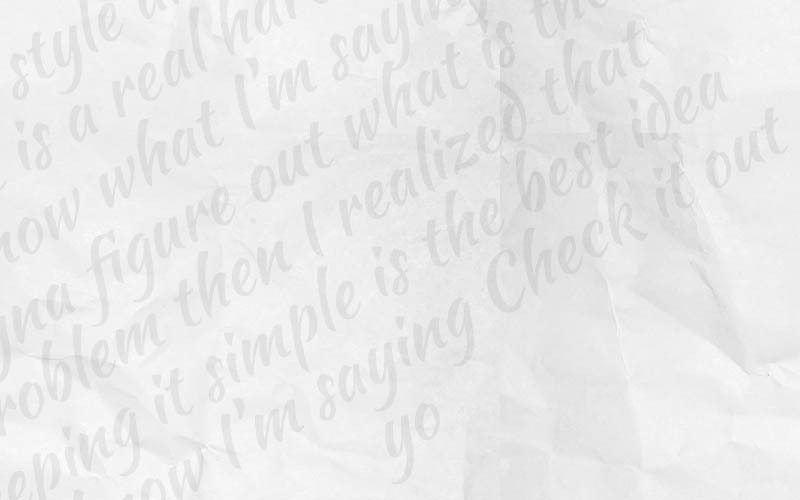 You can also, of course, simply use the readability features by dropping text in after you’ve written it elsewhere, or you can do it the other way around and export to Word or PDF afterwards. There’s even the ability to publish directly to WordPress and Medium. It really feels like someone sat and thought about what features writers would really need here. If writers.work can work out how to build in a plagiarism checker in the future, I’ll be seriously impressed! Writers Work gives you the ability to maintain a portfolio of your writing work from within the system. (We’ve discussed the importance of a portfolio and shown ways to create one here). The portfolio functionality in writers.work is basic. What you see in the screenshot above is really what you get – a cover image, a profile picture, a place for a title and description, and the ability to add as many portfolio “clips” as you like. It’s OK, and it would work perfectly well as a writer portfolio, especially for someone just getting started. However, it doesn’t have the functionality of something like Contently. It would be good to see some extra features here, such as the ability to add images for each project and a way to include links to social media presences such as LinkedIn. 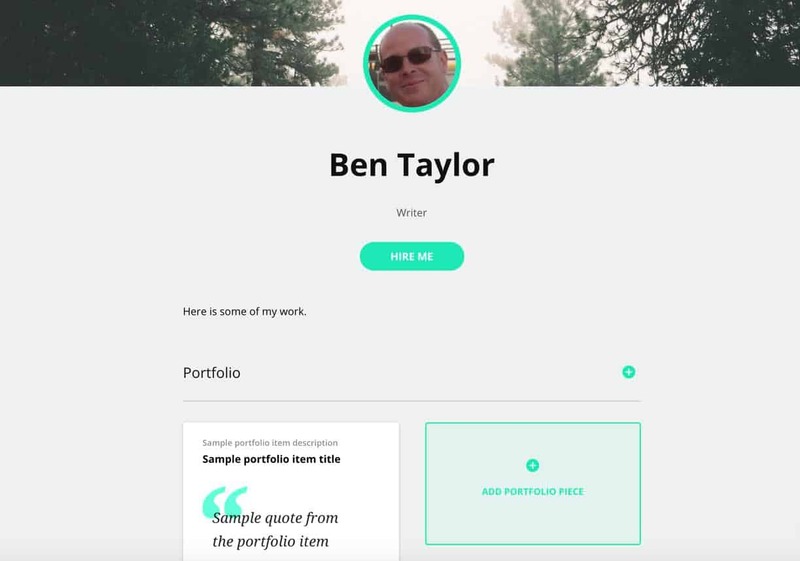 UPDATE: Since writing this section, I have been shown a screenshot of an updated portfolio section, which appears to contain new functionality, including the social media integration I mention above – so there’s good reason to expect that this area of writers.work may improve. The WritersWork university includes a selection of training materials, primarily videos, to help new writers learn the trade and the craft. The videos cover subjects from copywriting to pitching, and they’re well put together. You’re essentially getting a small but well-formed writing course included with writers.work, and the system keeps track of which modules you’ve completed. There’s not an enormous amount of content here, but given it’s just one of many features, it’s a worthwhile addition that’s well-implemented. As previously mentioned, it’s possible to track time in writers.work, which can help with keeping on top of what to bill clients. You can also set yourself writing goals (a feature that could, frankly, do with far more options beyond writing “X words per day”). There are also some statistics baked in to Writers Work, such as your words per minute over time and your total words typed. Obviously keeping these accurate is dependent on using writers.work as your text editor of choice. In addition to the features I have discussed, I’ve also been told that more are on the way. Specifically, there are plans for companies to be able to post writing job ads direct to writers.work, which could result in the platform having some exclusive jobs. 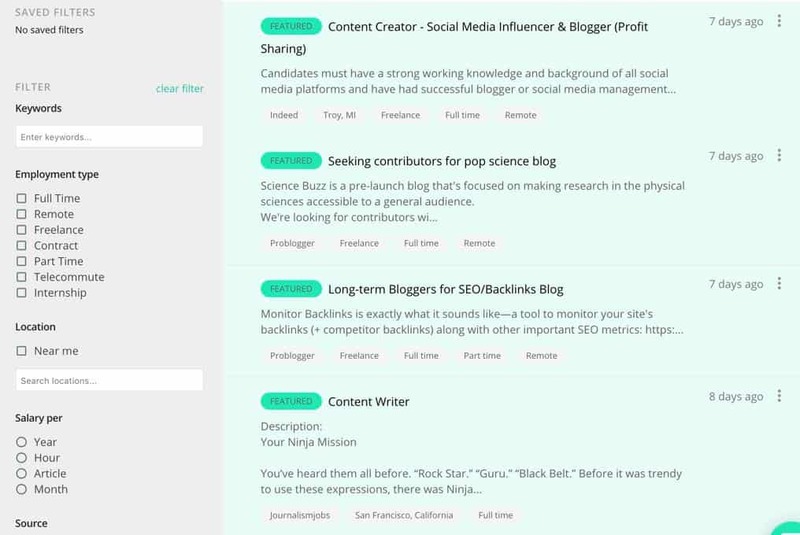 There are also plans for a freelancer’s marketplace, where employers can go to look for writers. Writers Work is in its infancy at the time of writing this review, but I get the distinct impression that plenty of thought is being put into how to develop it. The fact that it’s already slick to use is also a good sign. Shortly after publishing this review, a reader posted a long Facebook comment containing a series of worrying allegations about Writers.Work. Several of the criticisms were incorrect; The person claimed I wasn’t disclosing my affiliate relationship when there’s a disclaimer at both the top of the review and the footer of the page. He also had a theory that writers.work was using fake testimonial photos, something I quickly disproved when I discovered numerous photos also featured on individual writers’ websites or LinkedIn accounts. If you’re interested, I’ve discussed in detail what happened when all this came up in an article here. However, my investigations did find that the reader’s primary accusation was correct, which is that the people behind writers.work are the same people who were behind MasterWritingJobs.com. MasterWritingJobs.com, which is now closed to new members, has a terrible reputation online, with many people describing it as a scam. In the interests of being completely fair, I think it reasonable to point out that many of the bad reviews of the product are found on websites that then go on to try to sell you their own writing course – so this is far from a black and white situation! However, from what I’ve read about MasterWritingJobs, the company used some underhand marketing techniques, including implying that people could rapidly earn money writing if they bought the product, regardless of their experience. Now, to me, it should be blatantly obvious to anyone that the world of writing can’t possibly work like that. At the end of the day, this is all about marketing. I’ve found it interesting that people who comment about Writers.Work are polarised on this issue, with some even saying that I am too harsh in my opinion! This is the kind of marketing we’re talking about. Someone sent me a screenshot of the advert below. Please note that I’ve since been told that the adverts don’t make everything sound quite as easy as this one does. Well, writers could sign up to Writers.Work and start training straight away. And if they proved good at writing, they could start to apply for jobs, and once they got one, it’s quite conceivable that they could earn $20 per hour or more. But it’s also quite possible that someone could join Writers.Work with neither the writing skills nor drive nor business acumen to ever earn a penny as a home-based writer. As far as I can see, Writers.Work are doing nothing illegal. At worst, they’re profiting from some people’s gullibility. It’s not cool, but it’s the way of the world. Writers.Work is essentially a job board and toolkit for writers – it’s not a magic spell that’s going to create a career from nowhere. So, the decision you have to make is whether to buy Writers.Work on its merits, or avoid it because of some questionable marketing messages. You CAN trust in my integrity on this – because I investigated the situation the second it came to my attention, and have disclosed what I have learned in full here to allow you to make a decision. I did this with the full awareness that it will inevitably reduce sales! This section lays out everything I now know on this, and have confirmed with research and (very long) emails back and forth with the founder of Writers.Work. The decision on whether to purchase has to be your own. Even though some of the component parts of Writers Work feel rather shallow, particularly the “goals” feature, it’s impossible to deny that you get rather a lot for less than 50 bucks, which is the current one-off payment for a lifetime membership. The monthly payment option works out more expensive, but gives the option of dipping your toe in the water – and there’s a money-back guarantee too. Some of the component parts of writers.work are really well thought out; The text editor charmed me when I didn’t expect it to at all, and the job listings are nicely bulked out with the addition of the pitching opportunities. Oddly, while no individual component of writers.work would necessarily justify its purchase, when everything is put together it creates a rather compelling package – especially for novice writers who will enjoy getting stuck into the training resources. Established writers who already have processes for their work and a portfolio set up elsewhere will find less to get excited about here, but there’s definitely a market for writers.work, and I suspect plenty of people will enjoy using it. Inevitably, some potential purchasers will want to factor in the overblown promises the creators of Writers.Work made with its previous iteration, especially as they seem to have fallen for the temptation of making similar promises again. Understandably, some people will be put off by these things, which is why I’ve explained them in full in the section above. At the end of the day, $47 is not a lot to invest in a new freelance career, especially given that this essentially has a freelance writing course built in. However, if you’re going to buy it, you need to know that you’re buying something that will potentially help you to establish a writing career if you have the skills, drive and determination to work at it. The company’s adverts might suggest it’s easier than that – but it’s not. You’ll find Writers Work here. If you’d rather look for remote work, direct with an employer, have a look what we have to say about FlexJobs! While writers.work may not be something every writer needs, it's a decent bundle for people getting started at a friendly price. However, some people will inevitably be put off by the company's somewhat seedy previous foray into products for writers and their rather exploitative advertising. I just tried to create a portfolio on Writers Work and encountered SO many problems that I gave up! It is NOT good software, there are no tutorials, and it’s not intuitive. I am cancelling my subscription, since I already have a great portfolio on Coroflot, and you can find all the same jobs on other sites. Thank you so much for this insight!!! I can release the panic. Because as you mentioned, the marketing is misleading. I know that there is still competition in the market but it does sell as a get paid quickly and almost like they set you up with opportunities or that there are so many opportunities that money can always be made. From what I seen myself and your review, I’d say your review is right one and accurate. Now, I still want a work from home job. So I am back at the beginning. I took value from and enjoyed reading this post, thanks. It’s clear that you take care with your work (which is lovely). If you update this post, you may want to correct the following. Thanks for the info, I already bought in but as I have a lot of writing experience (for private companies, lots of blogging, nothing big freelance but hoping to make some headway) and I come from a huge marketing background I know what is marketing spin and what is not. For those might buy into the big promises and have no writing background, they are what is meant by ‘a fool and his money are soon parted’ but for $47 the damage is minimal. Of course, on a plus side, I discovered your website and will be spending some time on it. SO before I actually sign up for this, how many people have actually gotten paid as it says without problems. I have done many of these gigs, but never actually got paid for my work. So I don’t want to waste more time and money. Please comment back. Ashley, As described in the review, Writers.Work is a service that curates writing gigs from other sources, so it’s not a question of THEM paying you. You still need to apply for and win gigs and negotiate how and when you are paid with the individual clients. Speaking of getting paid, l if not paid through “writer’s work”, how would one get paid? What if you’re outside the USA, I’m from Canada for instance. 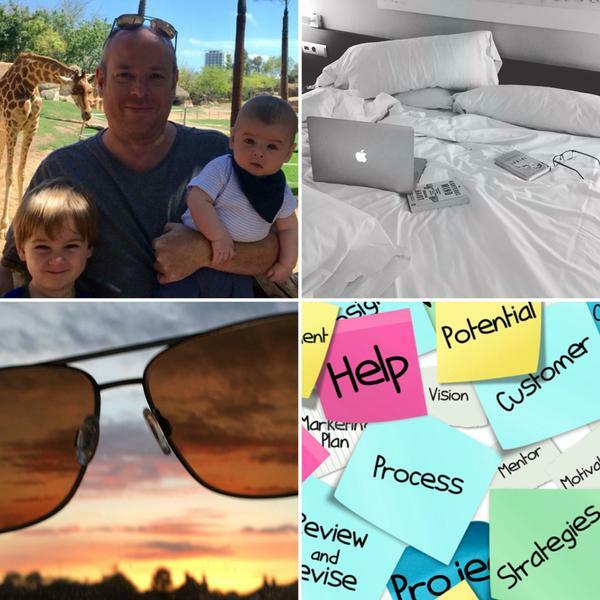 How you get paid is entirely down to what you arrange with each individual client. Some clients may specify they want US writers, but location isn’t usually an issue, certainly not in Canada. I signed up for writers.work about 2 months ago, after reading this review and feeling satisfied with the investment v/s reward ratio. However, today I spent about 5 hours working on a document only to have it spontaneously disappear with no recourse for retrieval. I used the website’s messaging tool to speak with a representative from the support staff, but I was told there is nothing they can do. While they were very apologetic about the “inconvenience”, there is no way to retrieve my work (a 4000 word document). They offered a PDF download of their writers work tool kit at no cost, but I asked for a refund. They issued me the refund and continued to apologize, but I think anyone interested in using writers.work should know ahead of time, should this happen to you, there is currently no way for them to retrieve previous saved versions of your work. This seems like one of the first failsafes that they should have invested in and created before even offering the service and requesting payment. The rest of my experience with them has been fine, and they were very apologetic, but I suspect this is not the first instance that this has happened. Until they find a solution I will not take the risk of wasting my time again, nor would I recommend this site to anyone else who values their own time. Oh dear, that sounds unfortunate. Sadly it’s a bit of a rite of passage for any writer to lose a huge chunk of work due to issues saving at some point, regardless of what platform they use. I’ve personally conditioned myself into doing a regular CMD+S on Word on my Mac after having lost work too many times. Writers.Work’s editor is browser-based, which is the same as me working directly in WordPress on this site – it’s something I do on a smaller posts but I personally only work on larger documents in Word – there is an option to do the same and then copy and paste them into WW’s editor to make use of the readability features. Sorry to hear you had that experience. On the plus side I’m glad you had decent customer support and no quibble over your refund. I signed up on October 26, 2018 and I am finding it challenging to say the least to access the dashboard and document editor that the University encourages you to use. I am looking forward to pursuing my writing career as a freelance writer but I must admit I am becoming more skeptical after reading comments and what I am experiencing. I do like the modules on the University side but reality bites I am interested in generating an income sooner rather than later any input would be appreciated. I read your review of Writers Work which I found really helpful, although I do have a question. You made reference to the ‘jobs listing’ suggesting it could be better and sourced listing from Indeed and Problogger which can be found by anyone. So, my question is, do you have preferred job listing sites? From what you saw in the listings, would a beginning writer, armed with the teachings from their training, be able to get themselves a gig? I’ve tried to get work at content mills and have been rejected twice with no explanation. I saw this and thought it looked promising but when the fee came up my heart sank. I’m currently unemployed and job-seeking, so 50 dollars is a lot of money for possibly no return. It’s almost impossible to answer that question. A novice writer with in-depth knowledge on a relevant topic and the ability to write a great cover letter could find it easier to score a specific gig than a more established writer with a poorly written letter and no knowledge of the topic. That’s more relevant to how things work really. Definitely a must read for anyone thinking of making extra money writing as I am. Thanks a bunch for your integrity, grit and honesty in researching all of the nuances of this company. I truly appreciate your most in-depth insight of this online offer. It truly helped me make my decision and research several other websites for writing. Take care and keep updating. It’s interesting to read everyone’s views in the Writers Work product. On the whole, everyone seems to have a positive outlook which gives me hope the product and most importantly, the support, is worth the time and effort, rather than the money. The Writers Work is an inexpensive product but even if it’s cheap, it needs to be worth the time needed to invest in learning, and hopefully gaining from the experience. My experience has been something of a letdown and I’ll tell you why. Recently I signed up as an affiliate, adding their link to one of my sites, and since that time I’ve sent a multitude of emails to support asking for their promised affiliate login, so I can write my review. So far, I’ve heard nothing, nada, zilch, bupkus. This doesn’t bode too well in my opinion, and I certainly hope those of you who signed up for the product are seeing a very different side to this coin. Thanks for sharing that. I was one of the first to review the product and had the opposite experience, getting a lot of my questions answered! I have to say that as an affiliate for many things, I do sometimes find companies go uncommunicative. As an example, a couple of days ago I heard back on an affiliate application I’d put in months ago and completely forgotten about. I’ve always heard back from their live chat, perhaps try that? Does that mean that a particular ‘old’ article kept-in is still pending for submissions required? and if Not, does that mean the tools uses a some sort of ”smoke screen” to give the IMPRESSION of quantity as per opportunities? Please feel free to write to me directly. Thanks for your time! Hi Hugo. Thank you for your comment. I wouldn’t describe it as a smokescreen, as such. Job ads staying up after positions have been filled is a problem on job boards of all descriptions, but filtering a search by “date added” is a reasonable way to avoid the “oldest” ads, which is why I highlighted this as a shortcoming. This answered my question, thanks a lot Ben. Very much enjoyed your frank opinions and experience. Having helped over 1600 inventors and written patents for ? Lost count. My work is highly specialized. Lost a good friend I was with for ages and searching that category and other technical writing. Somewhat discouraged by idiots who place adds offering chicken feed in return and expectations of far more than a typical writer can truly provide. I have joined your mailing list and ask anyone who can refer me to firms and people needing patents to share if they like. The are several forms of writing not to my liking and sharing such notices in no way offends me. I have a family member who used to do that kind of patent work. I did have a quick look on the freelance platforms like Upwork and there are people looking for help with patents but you will probably find most want to pay an insultingly low amount. There are usually diamonds in that rough if you persevere, but looking direct to companies does strike me as a better strategy. Hi there. I think – sadly – it’s inevitable you’ll encounter plenty of jobs that are only open to people in the US and/or UK, as is so often the case. That’s the main thing I’d think about. Hi, i’m about to graduate college and move home for a couple of months to save up money for the next big adventure. I was looking into Writers.Work to do a sort of work-from-home thing for that time. I have very limited experience being a freelance writer, but I am a very proficient writer after my college years. Would this be a viable option for me to get some money saved up over a few months? All opinions welcome. Thanks in advance ! Hey Ben, Thank you so much for making this review! I was searching for a while for someone to show me the other side of the coin after watching writers.work’s promotional video. I got really excited about the service but I knew it couldn’t be all true. Thanks for your unbiased take on the platform! It was really helpful. And in a roundabout way, I kind of found what I was truly looking for not with the review but with this site in general! I was looking at a ton of homeworking type jobs which lead me to writers.work which lead me here. So thank you and I’ll definitely be reading through your other reviews and hopefully become an avid subscriber of this site as a whole. Hi Ben, I like your website and believe as a writer I’ll benefit much from it. I also think your review on Writers.Work was very informative, able to help me with my decision as to whether to buy in or not. However, I think you’re being unfair toward Writers.Work with your opinion regarding their marketing. When I started to research their site, the very first thing I’ve noticed in their video was their mentioning that this is NOT a getting-rich-quickly scheme, but that excellent work MAY produce excellent income. You failed to mention this in your review. In the advert you use as an example above, they use words like you CAN earn these amounts and not you WILL earn them. They never promised that you will have results in 30 minutes, but that you can START within 30 minutes moving towards this goal. Any sensible writer knows their abilities and would know that Writers.Works did not mean what you suggested they meant. With regard to their previous product you admitted that most of their bad publicity was made by product owners with alternative agendas. The only other issue you’ve mentioned in this regard was their advertising method that appeared to have been the promise of getting rich quickly. Although I haven’t read that myself, I’ve noticed that this issue has been been dealt with in their statement I’ve mentioned above namely: “This is NOT a getting-rich-quickly scheme, but that excellent work may produce excellent income”. I therefore feel your article, however excellent is was, did injustice to the company and to potential people who will benefit from them. I couldn’t help to have noticed your advertising of opportunities soon after the article, which leaves me with the question how much you’re benefiting by putting them in a negative light. I hope this response doesn’t affect your relationship with me as a site user, but all along, as I was reading your review, I felt I had to stand up for them, even though I’m a complete stranger to both parties. I’m pleased to see your comment because it does demonstrate how polarised people can be on marketing messages like this. I perhaps lean more towards your way of thinking in that I think it’s common sense that you can’t suddenly establish a brand new lucrative career with an investment of under 50 bucks, but believe me when I say that plenty of others can feel utterly affronted that it’s not the case! There’s certainly no question of me benefitting from putting them in a negative light as I am an affiliate for them, and I’ve worked very hard on producing a review that shows the bad as well as the good. I have ad units on the site with Media.net and Adsense, but I can assure you that anyone clicking on those would earn me a tiny fraction of making an affiliate sale! I think you’ll find this article interesting as an example of the importance I place on integrity in such things. Hi Mr. Ben. Thank you for the article, it is very informative. This is my situation, i have always been interested in writing. But, i don’t have training to guide my creativity. My understanding from your article is that one can benefit from the university side. All that said, my concern is will the modules provide a good foundation for an ultra novice? The price (to me) is a great investment for the knowledge. I haven’t taken the course material personally, but you could also consider working through some of the material available free online such as this article from me (link), or a cheaper course on Udemy. Just a matter of grammar. Gerunds require the use of the possessive case “MY returning” and not “ME returning. You do this quite regularly and it grates on me. I assume it would also bother others with a language background. As a professed writer, you should clean it up. Please. Is this service good for writers who are pursuing freelance writing as a side hustle? I have a full-time, 9-5 job in the media industry and I’m looking for additional ways to make extra income using my skillset. Any opinions are appreciated. Hi Stefan, I’d say it makes no difference if you’re writing as a side hustle or a full-time venture – it’s a judgement call whether you want to spend money on what’s on offer. There’s plenty of writing advice free online, just as there are plenty of places to look for gigs free too. At the end of the day success is down to hard work and grind, and you can’t skip any of that by buying something for $47. I really loved this review. I was wondering in your opinion and experience do writers with no experience land jobs? In almost any field of work you require experience; luckily there are some places that are happy to train, but in the world of writers, will employers hire newbies? Obviously it’s far harder for people with no experience to get hired. Essentially anyone looking for writers will want to see examples of what they’ve written in the past. There’s help on building a portfolio here. I am in Canada, is this a U.S. company? So, basically they just provide the tools required. It’s up to you to use them properly and not to go in expecting to make a load of money off the bat. You still have to work toward your goals, and have the drive and commitment to do it. The only real issue with the company is their marketing tactics, so be sure to keep your expectations realistic. As far as everything else goes, the features work surprisingly well, but the listings need better content filters. Also, according to another comment, they need fail-safes in place so you don’t lose your works. Until then, just have multiple copies in different places (Google Docs, Microsoft Word, etc.) so you can copy and paste your work back into place and continue where you left off. Does this adequately sum everything up? Wow great article! I would love some information about how I can freelance from my home office. Does Writers Work publish technical and training materials writing opportunities? If so, this would be a great resource for me and my comrades in writing! Writers Work essentially curates opportunities from a range of other sources, so if those jobs are out there they should appear…I’ve seen technical writing like this on Upwork before. 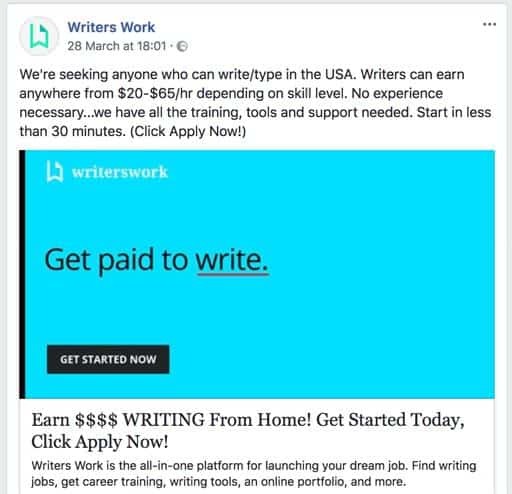 I found this write-up after watching a writers.work ad on facebook. As soon as I heard “this is not a get-rich-quick scheme”, my immediate thought was “how much do you want?” I’ll admit, $50 was fairly surprising. I was expecting your standard several hundred dollar price tag (with an “easypay” option of only X small payments of $99.99 if you act now, which is only half of the arbitrary value we had initially assigned, of course). The ad did seem misleading at first glance, but is it preying on gullibility or hubris? After spending an hour or so digging through various reviews and comments, the correlation between unhappy customer reviews and poor grammar becomes tragically comical. Identifying undeserved bad reviews was relatively easy, if not sinfully entertaining. It’s probably a good deal for those that already possess strong writing skills and are looking to get a foot in the door. If writers.work’s application process had thorough screening for unskilled/undesirable writers, I might have pulled the trigger and given it a shot. I’m more turned off at the idea of getting my hopes crushed and wasting time than blowing $50. So how can I actually “win gigs”? Honestly, this is Greek to me. How am I going to compete against someone who has been writing for 30 years and I have never even made a blog? I read a comment Ben did: “Writers.Work is a service that curates writing gigs from other sources, so it’s not a question of THEM paying you. You still need to apply for and win gigs and negotiate how and when you are paid with the individual clients.” So I am completely lost. I am not a professional writer, but can defend myself really well on orthography and speed on the keyboard, and I would like to make money for doing it, however, I am done with online scams that offer heaven but bring you hell. I do not have a background as writer so, how can I create a profile and attract clients if I have never done any job such as that? Is there like a “first arrived, first served” regarding the order of available gigs? Also, In MANY comments, I see that people says things like ” I’m more turned off at the idea of getting my hopes crushed and wasting time than blowing $50″ and comments like that. I am always up for saving some money but does those comments means that this is actually a waste of money, even if it’s only $50? If I could get some kind of presentation, e-mail or any kind of information I am sure that I can understand how this works and finally jump in but, I really want to see first what’s the catch… Thank you and have a nice day! Well the first thing to do would be to get started on a blog. – Applying for jobs where you have specific subject knowledge that could outshine the competition. – Submitting applications and pitches that really hone in on what the client wants and make them notice you. – Bidding at lower rates than more experienced writers. We’ve recently published a new article about starting a writing portfolio from scratch, which I think you’ll find useful. I’m glad I looked up reviews for writer’s work and came across this specific review which I found very helpful. If experience is the (only) game changer then where should a novice begin? Is there something available for a homemaker who has woken up from her 10 years long sleep to discover that everything in the world has changed while she was trying to raise a family? Anything you point at would be helpful as a passion to write is the only weapon I have in my armor at the moment. I just came across writers.work and was overjoyed with the idea of making money very quickly. However with your review and the comments, my expectations have calmed down. I have a BA in Journalism and have taken writing classes once in awhile just to keep up my skills. And although I do not have any PAID experience, I have done a couple of editing jobs for a Engineer major for his senior thesis. I also edited a speech an attorney was going to give. All of those editing examples are on my website with the original and my version side by side. Is that useful in getting hired? In addition to the editing, I’ve written my autobiography, so I have dozens of stories I can offer as an example of my writing style. Is there any place I could go to for someone to give me feedback? In other words am I good enough? How much could I ask for in payment? I would appreciate any feed back. You can email me directly. Hi there I signed up less then a month ago, trying to get my 30 day money back guarantee as I’ve now sent two emails with no reply from you guys. I’m wondering why you guys are so shady in not giving back refunds when promised ? Are you just a total scam like most people think you are or are you an actual company ? This is not how a company works. Also what is your contact phone number? I email no answer so I want to call to get a refund and they have no phone number. That’s suspicious. I don’t want to have to leave bad reviews so I ask if you can fix my issue before I do. To be clear, given you are saying “you guys,” WritersWork is an independent company, this is a review on a blog and we are not WritersWork. They do have live chat as well as a support email address. Is writers.work a legitimate website and does it in fact pay? I just saw on bbb.com that it is a “scam” and one person asked for their money back within the 30 day window and heard nothing. I would very much like to be a freelance writer but I am cautious of this site at the moment. I suggest you read the review in full. It’s not a question of whether Writers.Work pays because it’s a service that compiles listings of writing gigs from other sources and provides a set of tools and training materials fo aspiring writers. Writers.Work doesn’t hire writers directly so it’s down to individual clients to pay writers. Some of this misunderstanding is due to the service’s advertising methods, and this is fully covered in the review. $47 is never going to magically generate a writing career for someone with no experience, that’s the reality. Writers Work isn’t a scam, but it taps directly into what seems to be an inherent desire, among many, to take shortcuts and easy routes. I address this more fully in this article (link). Thank you Ben for taking the time to produce such an informative, well balanced piece. I am considering using the platform and this was a great help and a good read. There’s over 3000 words of review on this very page – perhaps read that? I also have to be honest, with no offence intended. There are more than 10 spelling and grammar errors in your comment. I don’t think it likely you’ll find it easy to win writing gigs. Thank you for a review I can understand and believe. Was thinking about joining Writers Work and because your review was so thorough and honest, I will be signing up through the link on this site. I also signed up for your emails and look forward to receiving them. I have a couple of FB group sites. Will recommend they check you out. Thanks Laura – all the best! I am searching for a second source of income. Something that is a part time work at home job. I have no writing experience. Would I be wasting my money and time. I have read several of the comments and am still very undecided. If you have no experience you would be wasting your time unless you’re willing to do a lot of training and hustling. Read this link for advice. I’m not sure what you mean. You subscribe on either a monthly or permanent basis, as described in the review. Whether or not you approve of Upwork’s fee structure, it’s not a scam.